When markets are surrounded with rumors and fake hoaxes its always good to take a bird eye view to understand the trading competition in a better way. From the EOD charts Strong ORR 10343 levels acting as a strong demand zone on EOD closing basis. Responsive buying came whenever price dipped below 10340 levels and managed to close above/around 10340 levels. Strong ORR is a critical support level as price rejected for the very first time during Gujarat Election Results. However more the responsive activity happening at certain level more it looses it importance of support. 10340 is a critical level support for any positional longs. 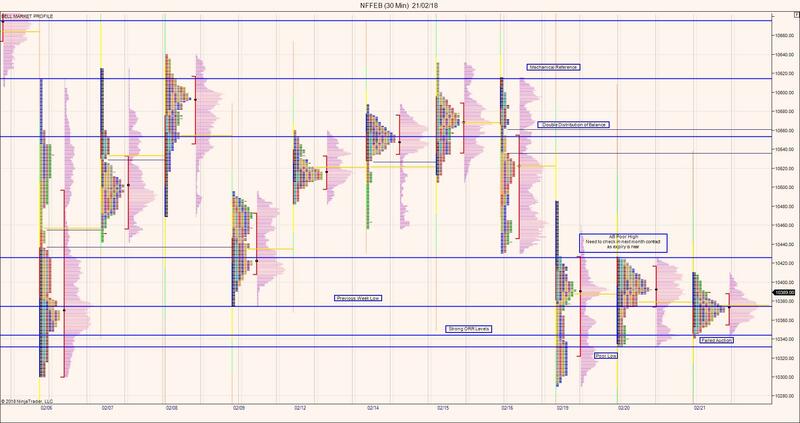 Nifty Futures is in a sideways move for the last three trading session as the value area is continuously in overlapping mode. More over on the daily timeframe it is a back to back inside bar. Which says that last two days we are dealing with more of short term and intraday players rather than long term money. Last two trading days more Trading activity centered around 10380 levels. 2)Acceptance below ORR 10340 – bring towards immediate visual reference on the down side 10100 levels.